The goal of the Exploring series is to move students beyond the point-and-click, to understanding the why and how behind each skill. And because so much learning takes place outside of the classroom, this series provides learning tools that students can access anywhere, anytime. Students go to college now with a different set of skills than they did years ago. With this in mind, the Exploring series seeks to move students beyond the basics of the software at a faster pace, without sacrificing coverage of the fundamental skills that everyone needs to know. MyITLab ® is an online homework, tutorial, and assessment program designed for Information Technology (IT) courses, which engages students and improves results. HTML5 Simulation exercises and Live-in-Application Grader projects come with the convenience of auto-grading and instant feedback, helping students learn more quickly and effectively. Digital badges lets students showcase their Microsoft Office or Computer Concepts competencies, keeping them motivated and focused on their future careers. MyITLab builds the critical skills needed for college and career success. Note: You are purchasing a standalone product; MyITLab does not come packaged with this content. 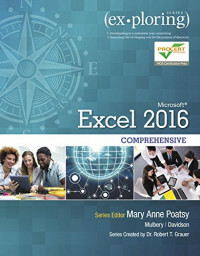 Students, if interested in purchasing this title with MyITLab, ask your instructor for the correct package ISBN and Course ID. Instructors, contact your Pearson representative for more information.